The colossal statues and architecture reminiscent of the ancient Egyptian era sets the iconic WAFI as a class apart. The mall and hotel are considered a site seeing place in its own right. With 300 shopping stores, fashion avenues, family & kids entertainment avenues 30 restaurants including Wafi Gourmet, and an authentic shopping and dining experience at Khan Murjan WAFI is easily one of Buzzingtale’s favorite hang out spots. On 5th September 2015 things got hotter at WAFI with WAFI Bazaar serving as a hub for local participants to display their talent. WAFI Mall is now initiating a true bazaar experience for its current and prospective customers. WAFI Bazaar plays as a home for a variety of local talents over a short period of time. 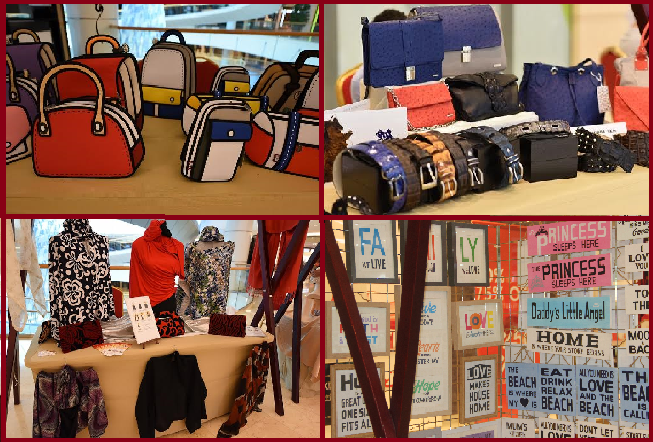 The Bazaar runs every Saturday which began on September 5, 2015 and will run through till November 28, 2015. Aspiring individuals showcase their collections ranging from fashion, to accessories, handicrafts, art pieces and much more! WAFI Mall assists a variety of local participants with the sole purpose of accentuating the expertise of men and women in the region. The mall continues to strive as an avenue for local talent. Here’s a snippet of WAFI Bazaar from September 19, 2015! Bringing the goodness of all things organic straight from France is French Organics with its wonderful line of perfumes and skin care products. The copper cove had an exquisite line up of home functional home decors, jewelry and kitchen utilities. The products are unique because of the antique feel they radiate. You will also be gripped by the fashion statements of cloth and accessory line at French & Lawless, Fannies Boutique’s exclusive collection of hand bags, Velvet Touch and Sofia & Lola’s kids wear, Dar Makresh’s dreamy kaftans, make up miracle kits from Anabe, stunning jewelry pieces from Eleganza, Beebsostyle and many more. Following our delightful bazaar experience we were left famished but not for long. Buzzingtales got to dine along with other media colleagues at Khan Murjan. If you truly wish to soak in the rich Arabian culture you have to indulge in its exclusive cuisine. Khan Murjan transports you straight to a medieval Arabic Souk, minus the heat & dust. Yes you can feast your eyes and senses on the lovely artifacts, aromatic perfumes on your way to the scrumptious spread that awaits you at the restaurant.